Caribou from the western Arctic Herd scattered across the tundra. Aerial photo by Geoff Carroll. A population survey conducted earlier this summer places the Western Arctic caribou herd at 201,000 animals, indicating the herd’s recent rate of decline has eased greatly. “The results of this photocensus imply that the population has continued to decline since 2013, albeit at a much reduced rate, which seems to be improving each year” said Caribou Biologist Lincoln Parrett. The summer survey supports information gathered earlier by state biologists indicating improved Western Arctic caribou herd calf recruitment and survival. Biologists and hunters at Onion Portage in 2015 observed that caribou were in very good condition compared to prior years with average body condition of adult females characterized as “fat.” Also, calf weights averaged 100 pounds, which is about 11 pounds heavier than the 2008-2014 average and is the highest average calf weight recorded in the eight years the department began collecting calf weights at Onion Portage. In an aerial photocensus conducted on July 1, biologists used radio-collared animals to locate bands of Western Arctic herd caribou. A DeHavilland Beaver equipped with a Zeiss RMK-A camera, shooting 9x9” black and white film, and two smaller camera-equipped planes were employed in the count. The Beaver was used to photograph all groups of caribou greater than 200, while smaller groups were counted from the other planes. Afterward, the photographed caribou were tallied and added to those recorded in smaller groups. 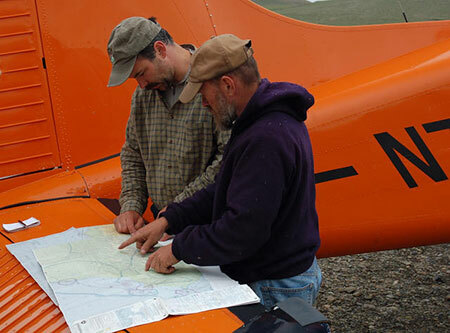 Caribou biologist Jim Dau (now retired) and biologist and pilot Tom Seaton plan a flight with the department's beaver to survey the Western Arctic Caribou Herd. Photo by Geoff Carroll. Overwinter calf survival for the 2015 cohort of calves was 82 percent and the spring 2016 recruitment survey, with 23 yearlings:100 adults observed, was the highest calf recruitment into the population recorded since 2007. High calf survival rates are being mirrored in the adult female survival rate, which is on track to be among the highest recorded in this herd. Biologists documented near record calf production in 2016. The July photocensus results come as the Federal Subsistence Board deliberates on a Special Action request by the Alaska Department of Fish and Game to reverse the board’s April decision to close caribou hunting on federal lands in Game Management Unit 23 to all but federally qualified subsistence users. The closure, which went into effect July 1, 2016, is scheduled to continue through June 30, 2017. State and federal advisory committees will be meeting this fall prior to January’s Board of Game meeting. The Western Arctic Caribou Herd Working Group – a cooperative body that meets regularly to reach consensus on research, monitoring, regulation, allocation and enforcement and to support education about the herd – will meet in December to discuss successful ways to keep the herd healthy and thriving. This new information will be essential to discussions about future management of the herd and how the Western Arctic Caribou Herd Cooperative Management Plan will be implemented. 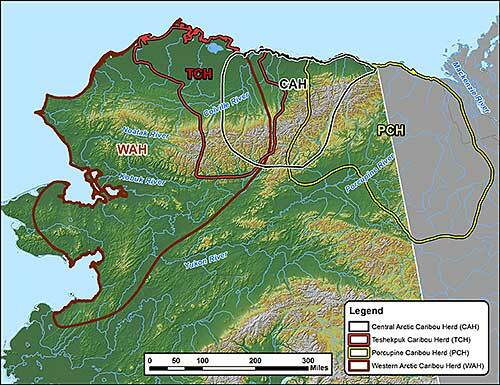 The ranges of northern Alaska Caribou herds, from west to east (into Canada): Western Arctic Herd (WAH), Teshekpuk Caribou Herd (TCH), Central Arctic Herd (CAH), and Porcupine Caribou Herd (PCH). The Western Arctic caribou herd is Alaska’s largest caribou herd. The animals roam an area of about 157,000 square miles that includes many landowners and management entities. Caribou availability and abundance has largely shaped the heritage and traditions of Native Alaskans living in some 40 subsistence-based communities region-wide. 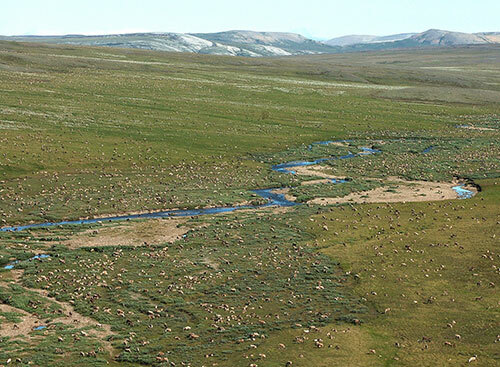 Four caribou herds have their calving areas on the North Slope. In addition to the Western Arctic Herd, the area is home to the Teshekpuk Caribou Herd, the Central Arctic Herd and the Porcupine Caribou Herd. The Porcupine Caribou Herd was most recently photographed on July 14, 2013. Caribou were widely distributed, with a large number in the Richardson Mountains in Canada, and the remainder in the eastern Brooks Range. The estimate for the Porcupine Caribou Herd was over 197,000, which is the highest ever observed for that herd. The Teshekpuk Caribou Herd was estimated at approximately 41,500 caribou in 2015. 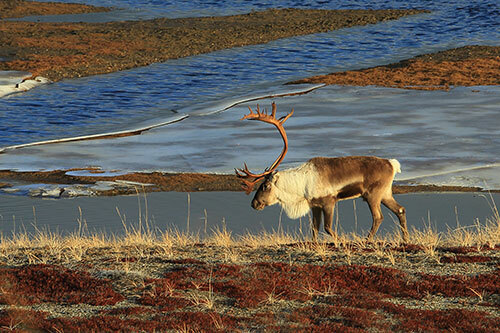 In July 2013, the Central Arctic Herd was estimated at 50,000 caribou. A photocensus was conducted in July 2016. An estimate will be available by the end of the year. Caribou herds mix, especially during the fall and winter. Genetic studies show that of the four North Slope caribou herds, only the WAH and Porcupine Caribou Herd, the western- and easternmost of the four herds, show genetic differentiation. This is not surprising considering that the ranges of these herds overlap during breeding season, or rut. In recent years the degree of mixing appears to be increasing, and many caribou that are mingled in the winter end up migrating with a different herd in spring. In the summer of 2013, almost 20 percent of the collared Teshekpuk Caribou Herd wintered in parts of the WAH range, and were with the WAH during the WAH photocensus. Similarly, the 70,000 caribou that were counted during the 2013 Central Arctic Herd photocensus included ten Porcupine Caribou Herd collars, which could represent as many as 20,000 caribou. A caribou from the western Arctic Herd, photo by Jim Dau. During the early 2000s, the number of caribou summering on the North Slope peaked at over 700,000 animals, perhaps the highest number since at least the 1970s. At that time, it was relatively rare for caribou to mix or migrate with other herds, either permanently or temporarily. If the large number of caribou in the late 1990s and 2000s had a negative impact on their ranges through overgrazing, caribou may be searching for new areas, increasing the degree of mixing between herds. Perhaps mixing will decrease as herds become smaller, but for now it is an issue that affects estimates of caribou abundance. For more information, contact Lincoln Parrett at (907) 459-7366 or lincoln.parrett@alaska.gov.